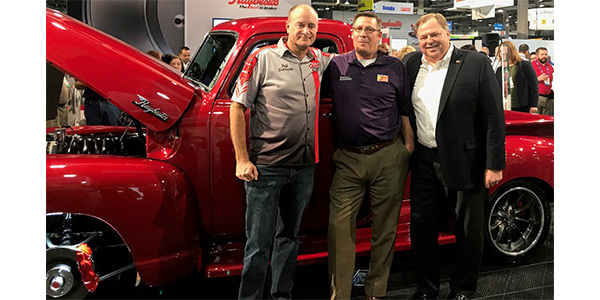 Charles Ruder of Brake & Equipment Warehouse in Minneapolis, Minnesota, hit the jackpot as the lucky winner of the Raybestos 1953 Chevrolet pickup truck given away by the company last week at AAPEX. Painted in metallic red, the fully restored and updated 1953 Chevy pickup features an off-the-shelf performance disc brake upgrade package using Raybestos components and Raybestos Truck & Medium Duty specialty disc brake pads. 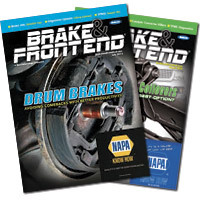 In addition to driving the build, Schwartz Performance installed its famous bolt-in “G-Machine” chassis. To see photos and video of the build progress from start to finish, visit RaybestosBuild.com. More than 20 industry-leading premier suppliers partnered with Raybestos and Schwartz Performance to help restore and modify the pickup while maintaining its historical integrity, including: American Autowire, American Powertrain, BeCool, BF Goodrich, Crunch, Dakota Digital, Dirty Dingo, Dynacorn International, Flaming River, Forgeline, Hushmat, Maval, Mechanix Wear, Moser, Remy, Optima Batteries, PPG, Ridetech, Rock Valley Auto Parts, SeatbeltPlanet.com, TechAFX, TMI Products and Vintage Air.